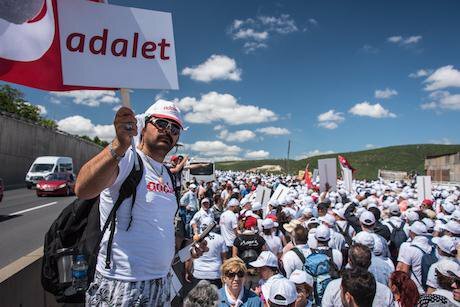 Protesters with the "adalet" or "justice" march passed through the towns of Tavsancil and Gebze as they approached their end point in Istanbul, Turkey on 7 July 2017. Opponents of President Recep Tayyip Erdogan have been walking from Turkey's capital, Ankara, to Istanbul in protest of ongoing purges and the jailing of elected officials. NurPhoto/SIPA USA/PA Images. All rights reserved.On July 9, Turkey’s 25 day-long ‘Justice March’, in which a procession of thousands of Turkish citizens slowly made their way from Ankara to Istanbul, came to an end in a peaceful mass rally. Despite a heavy security presence and fears that the protest might end in violence, it passed without a hitch. This was no small feat. A year after an abortive July 2016 putsch, the country remains under a state of emergency and, as a result, mass demonstrations are prohibited. However, whether out of fear or some other inscrutable political calculation, Turkey’s elected-despot Recep Tayyip Erdoğan, chose not to deploy force to this act of public defiance. Turkey’s Justice March is – or at least has the potential to be – a transformative moment for the opposition with regards to Erdoğan and the ruling Justice and Development Party (AKP), which has dominated Turkish political life since it rose to power in 2002. In the aftermath of last years’ failed coup attempt, Erdogan’s administration fired and/or imprisoned thousands of public servants; from military officers and judges to academics and high school teachers, they are all paying the price. To many this response looks far more like a purge than a legitimate response to a very real assault on Turkish democracy. These aren’t the only steps being taken towards the deepening of autocracy. In April, Erdoğan’s long held ambition to transform Turkey’s largely ceremonial presidency into the locus executive power came to fruition. In an ill-tempered and divisive plebiscite, Turks voted 51% to 48% to adopt Erdoğan’s constitution alaturca. Ruling from a newly constructed palace, which casts a menacing shadow over the Turkish capital, Erdoğan’s position as Turkey’s de facto sultan is unassailable. The immediate trigger for the protest, which was called for by the Republican People’s Party (CHP) – Turkey’s largest opposition party – was the imprisonment of one of its parliamentary deputies, Enis Berberoğlu. In June, a Turkish court convicted him on charges that he had leaked images to the press of Turkish intelligence services supplying weapons to Syrian rebels, sentencing him to 25 years in jail. In response, CHP leader, Kemal Kılıçdaroğlu, a former Turkish bureaucrat whose physical appearance and understated public persona earned him the moniker, Kemal Gandhi, called for the public to march in defiance of the sentence. With many affected by the wave of arrests, the call struck a chord with large segments of the Turkish public. In a piece for the New York Times, Kılıçdaroğlu does an excellent job of summarizing the state of affairs that carried many 280 miles across the Anatolian steppe at the height of summer. Yet, conspicuously lacking from the CHP leader’s piece was any direct reference to the plight of Turkey’s Kurdish minority. This absence is all the more striking given that, since 2015, violence between Kurds and the Turkish authorities claimed hundreds, if not thousands, of lives, devastating towns and cities across Turkey’s predominantly Kurdish southeast. Indeed Erdoğan, who one time sanctioned talks with the outlawed Kurdistan Workers’ Party (PKK), has over the last few years harnessed anti-Kurdish sentiment to help him consolidate power. However, this silence becomes more understandable when one considers that the CHP, as well as many of its supporters, have often been deeply suspicious of the Kurdish movement. While secular-nationalist Turks are implacably opposed to Erdogan’s brand of Islamism, they, like the AKP, regard Turkey’s Kurdish question in highly simplistic terms, either as a security issue or one of economic underdevelopment. Hence, there is a degree of irony in the CHP’s search for justice, considering their complicity in passing the very law that paved the way for Berberoğlu’s prosecution. Historically, Turkey’s parliamentarians enjoyed special immunity from prosecution, an important protection for opposition lawmakers given Turkey’s history of authoritarianism. However, in May 2016, a few months prior to the failed coup, the Turkish parliament passed legislation, supported by the CHP, to remove these protections. At the time, the target was the pro-Kurdish Peoples’ Democratic Party (HDP). This set the stage for a wave of mass arrests of Kurdish activists, including HDP’s co-leaders, Figen Yüksekdağ and Selahattin Demirtaş, who have been languishing in jail since November 2016. In effect, Erdogan removed the HDP from Turkey’s political arena. In doing so, he eliminated one of the main centres of political opposition, one whose success had denied the AKP a parliamentary majority in the July 2015 elections. The failure of the CHP to support the HDP proved disastrous last year; they are now alone facing a greatly empowered Erdoğan. For the CHP, as well as Turkey’s opposition more generally, overcoming the animosities with the Kurds is imperative. Erdoğan was, in part, able to consolidate his electoral power-base by making strategic concessions to Kurdish opinion. In fact, there was a time when Erdoğan won praise and plaudits for his relatively progressive stance on Kurdish rights. That time may have long since passed. But the Kurdish question remains vital for the future of Turkey’s democracy. Should the CHP truly wish to shake the AKP's vice-like group in Turkish body-politic, they must reach out to Turkey’s Kurds. For that, serious self-reflection is critical. The CHP leadership, as well as secular-nationalist Turks, have to ask themselves which they find more distasteful: Erdoğan’s autocracy or concessions on Kurdish rights?